We use electricity and natural gas safely every day in our homes, from turning on the TV or radio, to switching on a light, to playing video games or turning on the gas heat and cooking on a gas stove. Sometimes, however, energy can be dangerous. 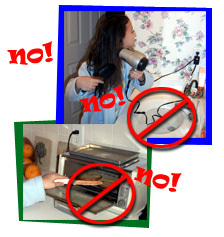 Overloading a circuit can cause a fire or electric shock. Natural gas is burned, which means there is a fire on the stove when you're cooking.